Further the purposes of the APA in the Section area. To meet this purpose, Section members organize a Section Council, which consists of both voting members and non-voting section advisors. There are situations outlined in the bylaws to allow Section membership to take positions outside of Section Council action if there is a need. Section bylaws denotes that there are a maximum of fourteen (14) voting members of the Section Council. Section 5 of the bylaws outlines the duties of the officers, while section 6 of the bylaws outlines the remainder of the council and general Section Council duties. The terms of all elected Section Council members shall be two (2) years. Members of the Section Council shall take office on January 1 of every even numbered year. There are more details on the requirements on voting members in our orientation guide. Even those who aren’t voting members are welcome to participate as a section advisor or committee member. There are any number of non-voting section advisors in addition to the voting Section Council. Section advisors include those who are actively involved at Section Council or committee meetings, but not officially elected. These members are often sought to be appointed to vacant positions or encouraged by the nomination committee to run for elected office. Student representative section advisors represent schools in the region which have a planning program to assist with communication between the Section, students, and program administration. Typically each school has a first year representative and a second year representative to allow for continuity after graduation. Student representatives help inform the Section Council of activities in their university by attending or calling into Section Council Meetings. They also help inform their classmates of the mentorship program, scholarship applications and other Section and Chapter events by coordinating with the administration at their university. Any additional students are welcome to take part in Section Council or the Events and Emerging Professionals Committee meetings. The Section Council meets every other month to conduct business. Each newly elected committee discusses a regular day and time that works best. All meetings allow a call in option for participation from those living further out in the region. Bylaws require elected council members to participate in at least half of the annual meetings. Section Council meetings are open to everyone, whether they are an active APA member or just interested in learning more about APA PA SE. Section 7 of the bylaws also allows for the creation of committees to work on specific task areas and report back to the Section Council. Committees can meet regularly or as needed. See more detail on specific committee contacts, activities and coordination on our APAPASE Comittee Coordination page. Meets regularly (about every other month) to work out details of events and make recommendations for events to the Section Council. To join or learn more about the Events Committee email events@apapase.org. Meets as needed to guide communication and growth of the organization. This committee works to diversify and increase membership and in securing sponsors. The committee assists in reaching out existing and new members to help them get the most out of their membership, and encouraging more diversified membership in the planning field. To join or learn more about the Engagement Committee email chair@apapase.org. The newly formed education committee is combining the work of the long-standing scholarship and mentorship programs to do more comprehensive outreach to educational institutions as various levels. The scholarship program solicits and reviews student projects for the award of the annual scholarship. The mentorship program pairs students and planning professional section members to help students gain advice in job and internship searches as well as learning about the variety and day to day responsibilities in planning jobs. To join or learn more about the Education Committee email scholarships@apapase.org. 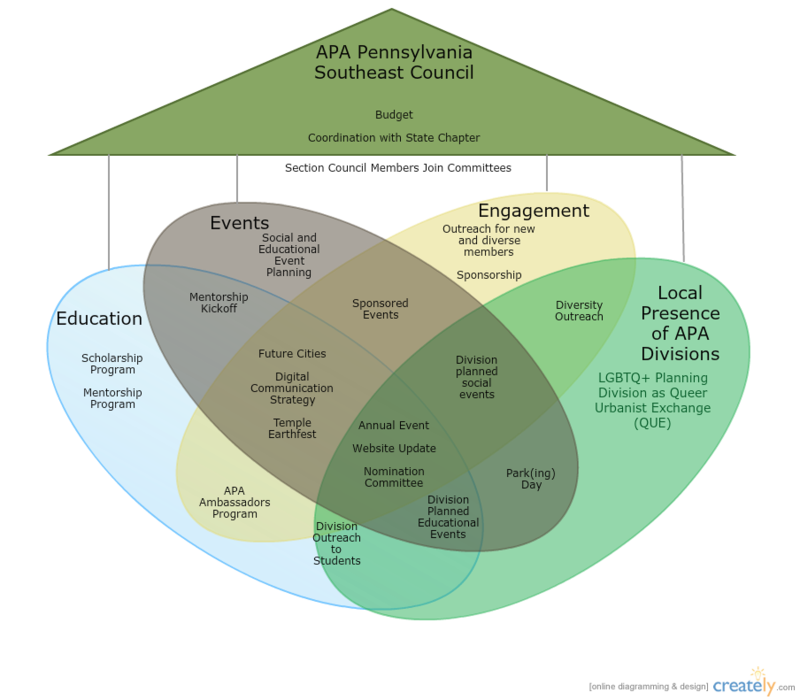 APA has several divisions at the national level that are either professional interest or population based. APA PA SE encourages interested members to start a local presence of the national division to provide more regular networking benefit from their division membership. Currently there is one APA division with a local presence. Meets monthly as the local presence of the LGBTQ + Planning Division of APA, which includes architects, landscape architects, engineers, other urban design professionals, and urban enthusiasts to network and plan educational events. To learn more or join QUE, sign up for the Facebook Group, Meetup, Google Group or email quephl@googlegroups.com. To meet our purpose, a major activity of the Section is to hold an annual section meeting and periodic educational and social events throughout the year, depending on interest from members in planning events. If you have any suggestions for increasing attendance at, types of, or topics for events, please email events@apapase.org or suggest them at a future Section Council or Events & Emerging Professionals meeting. Please encourage your friends and colleagues to attend any Section events that may be of interest as they are created. Every year, APA PA SE holds an annual section meeting, commonly referred to as the annual event. The annual event is the flagship event for our membership, where we also award our student scholarship winners. To encourage members to attend, we seek to provide an exceptional program at a reasonable cost and to alternate the venue for the event between central Philadelphia and suburban accessible locations. As the annual event is our flagship event, we usually form a small subcommittee devoted to planning the annual event and encourage all interested members to take part by contacting events@apapase.org. For questions about the site, email admin@apapase.org. To become an APA National member, click here or you can join just the APA Pennsylvania Chapter by clicking here. Moved? Changed jobs? Need to update your information? Email admin@apapase.org.